While she was writing columns for The Irish Times and her best-selling novels, Maeve Binchy also had in mind to write a book that revolved around one street with many characters coming and going. Every once in a while, she would write about one these people. She would then put it in a drawer. "For the future," she would say. 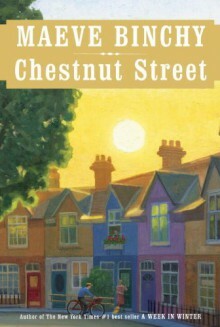 The future is now.Just around the corner from St. Jarlath's Crescent (which readers will recognize from Minding Frankie) is Chestnut Street, where neighbors come and go. Behind their closed doors we encounter very different people with different life circumstances, occupations, and sensibilities. Written with the humor and understanding that are earmarks of Maeve Binchy's work, it is a pleasure to be part of this world with all of its joys and sorrows, to get to know the good and the bad, and ultimately to have our hearts warmed by her storytelling.